There are always strange things to find in Japan, things I am not used to seeing in Norway. In Nagoya we found Smash Head. A bar, and also a motorcycle repair shop. Get your bike fixed, and have a burger and a beer at the same time. We had been five days in Japan now, the first visit for both of us. The first four days we spent at Japan Grand Prix, the Formula 1 race at Suzuka Curcuit. Now we had two weeks of exploring Japan in front of us. My friend was feeling a lot better after his incident in Amsterdam, now he was almost back to his old self. 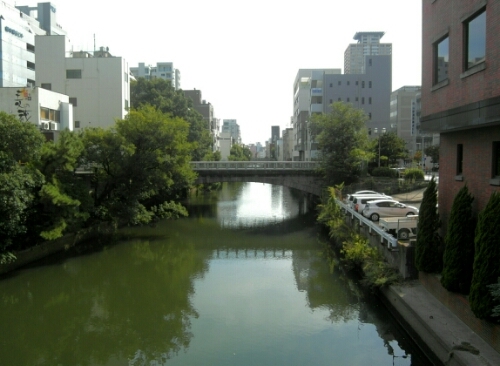 Today we were in Nagoya, which might not be the first city on a tourist in Japan’s list, but it was where we had stayed while watching the Formula 1, and why not see the city while we already were here. The first city I saw in Japan was therefore Nagoya. We didn’t make any plans that day, except for sleeping in a bit. The last few days we had gotten up early to get to the Formula 1. Suzuka was two hours by train away, and my friend wanted to be there early every day. It had been some journey to get to the track at times. On our day in Nagoya we did not get up before noon. We set out from Nagoya Station, past Midland Square, walked down the street. No plans in mind. Like me, my friend likes to travel without many plans. We set out in a direction, made some turns, see where we would end up. Sometimes, I think I am following him while he thinks I have a plan for where to go. We always find something interesting sooner or later though. 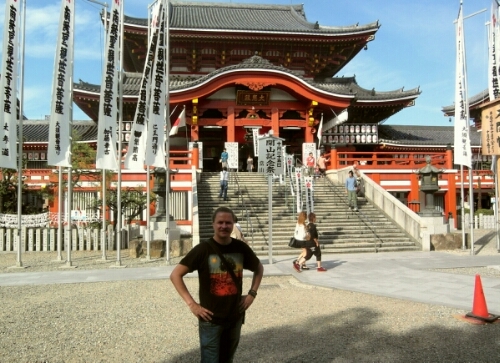 Being the first real day in a Japanese city, not just being at a race curcuit, I was inundated with impressions. The shops and businesses looked different from Norway. All the signs were in Japanese, buildings did not look like the buildings I was used to. Everything was so big. Suddenly we came across a small shrine, next to it lay a 7-eleven, then another shrine. Not the things you expect to see next to each other. It was all so new, so cool, so interesting. We were in Japan, and I loved it. After lunch at a local café we felt like a beer, started looking for a bar. It was then that we found Smash Head, tucked away is a small street behind a temple. We went inside, found ourselves in the bar. A few tables, several seats along the counter. A TV was on, hanging over the bar, showing Top Gear. If you walked through the room, to the back, you got to the motorcycle repair shop. A bike was standing there, but no one was working on it. We found a table to sit down at, ordered each out beer. The beer of choice at the bar was Guinness. A bit tasteless I think, but easy to drink. We spent some hours there. Chatting, drinking beer, watching Top Gear on TV. We figured we were destined to find this bar, Smash Head, after my friend had smashed his head in Amsterdam just days earlier. That day he got a new nickname. We returned to the bar later that night, had been sightseeing in Nagoya for a few hours after leaving Smash Head from our first visit. We were hungry again, and wanted to check out their burger. As we entered the bar and sat down, the Top Gear episode from Lillehammer in Norway had just started, this was clearly a bar for us. Named after my friend and showing TV from Norway. We ordered each our teriyaki burger and a Guinness. The burger was tasty, though I felt it had a bit too much sauce on it. The meat and bun was drowning in sauce, overpowering the taste of the meat and turning the bread soggy. Smash Head is a cool bar in Nagoya, the combination of bar and motorcycle repair shop is something I have not seen before. Does it promote drunk driving in a way? I don’t know. If you are in Nagoya I recommend paying a visit to Smash Head. 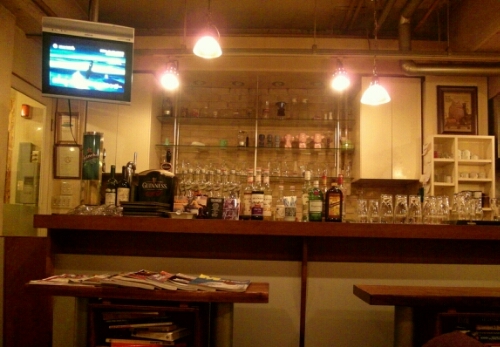 It has good food, beer and is different from your normal bars. We had a great time visiting Smash Head back in 2012. 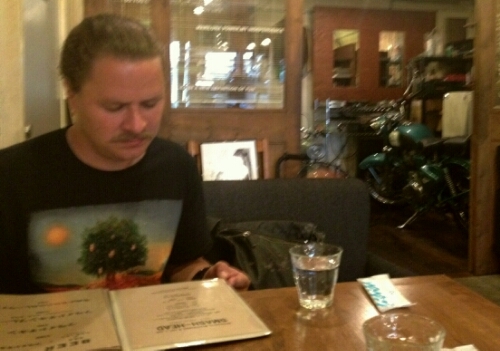 This entry was posted in Japan and tagged bar, beer, food, Nagoya on September 22, 2016 by Traveltorgeir.